Terry Peattie conducts these monthly workshops, which currently consist of two groups (one group meets on the third Sunday, the other on the fourth Saturday of each month) with 10 members each. 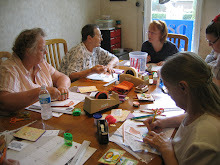 Each month a 2-page spread project is presented and taught involving various mixed media techniques. Those who are not regular members of the fixed groups are able to sign up to attend as a “guest” in the event that a regular member is unable to attend. Please contact either Sharon or Terry if you are interested in signing up to have your name added to attend (possibly) as a guest.